Knowing that you will be wearing your simple but meaningful wedding bands for the rest of your life makes choosing your wedding rings more difficult than it should be. Classic wedding bands are an important element of becoming married, but they are also a long-lasting symbol of your personality, style and commitment, so when choosing your wedding bands, make sure they are custom and express the three things mentioned. When choosing the metal for your custom wedding bands you need to consider the metal of the engagement ring. The bride should have both rings custom made from the same metal. The groom can choose a similar custom wedding band, or a band made of other metal. 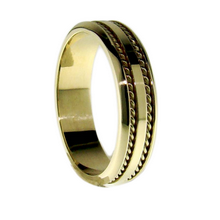 If you want to fallow the tradition you will go for simple yellow 24k gold wedding bands. Platinum wedding bands are also a classic choice because it is highly resistant to damage. If you are a modern couple you can go for a titanium wedding bands, which are resistant and can be easily carved. The shape of your wedding bands is another element that needs to be matched with the engagement ring. If the engagement ring is straight-edged, classic, straight-edged wedding bands will sit snugly next to it. If the wedding bands are modern and don’t accommodate the engagement ring, you can wear them on different hands. When deciding the style of your wedding bands make sure they will have a custom design you will be comfortable wearing for the rest of your life. The classic yellow gold will always be fashionable. If you are thinking about a more modern look you should choose channel-set diamonds. If you want something custom you should think about the things you have in common, and choose wedding bands that can express that thing. For example a couple chose to have wedding bands custom-made that resembled bicycle gears, reflecting their mutual love of bike-riding. If you chose different shape or metal for your wedding bands, you can customize them by engraving them. You can write anything you want: a quote, your wedding date, your initials, using whatever style suits you best. Engraving you wedding date is classic and helps you not to forget your anniversary. Culture is another element which needs considering when choosing your wedding bands. For example if you are an Irish, classic Celtic wedding bands could be an option, if you are an Italian you should look for modern diamond wedding bands.